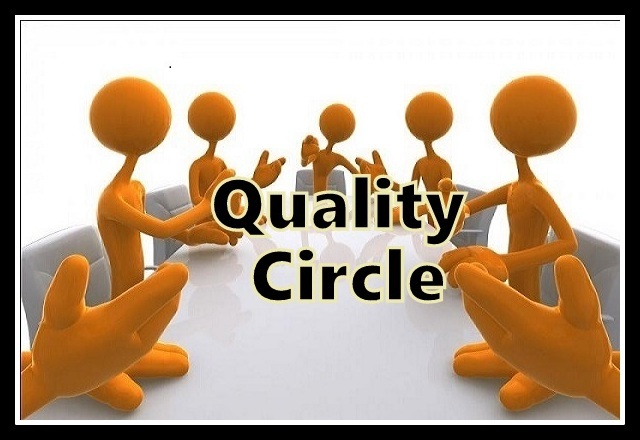 A quality circle or quality control circle is a group of workers who do the same or similar work, who meet regularly to identify, analyze and solve work-related problems. Normally small in size, the group is usually led by a supervisor or manager and presents its solutions to management; where possible, workers implement the solutions themselves in order to improve the performance of the organization and motivate employees. Quality circles were at their most popular during the 1980s, but continue to exist in the form of Kaizen groups and similar worker participation schemes. A quality circle is a volunteer group composed of workers , usually under the leadership of their supervisor , who are trained to identify, analyze and solve work-related problems and present their solutions to management in order to improve the performance of the organization, and motivate and enrich the work of employees. When matured, true quality circles become self-managing, having gained the confidence of management. “A Quality Circle is volunteer group composed of members who meet to talk about workplace and service improvements and make presentations to their management with their ideas.” (Prasad, L.M, 1998). Typical topics for the attention of quality circles are improving occupational safety and health, improving product design, and improvement in the workplace and manufacturing processes. The term quality circles was most accessibly defined by Professor Kaoru Ishikawa in his 1988 handbook, “What is Total Quality Control? The Japanese Way” and circulated throughout Japanese industry by the Japanese Union of Scientists and Engineers in 1960. The first company in Japan to introduce Quality Circles was the Nippon Wireless and Telegraph Company in 1962. By the end of that year there were 36 companies registered with JUSE by 1978 the movement had grown to an estimated 1 million Circles involving some 10 million Japanese workers. Contrary to some people’s opinion this movement had nothing whatever to do with Dr. W. Edwards Deming or indeed Dr Juran and both were skeptical as to whether it could be made to work in the USA or the West generally. Quality circles are typically more formal groups. They meet regularly on company time and are trained by competent persons (usually designated as facilitators) who may be personnel and industrial relations specialists trained in human factors and the basic skills of problem identification, information gathering and analysis, basic statistics, and solution generation. Quality circles are generally free to select any topic they wish (other than those related to salary and terms and conditions of work, as there are other channels through which these issues are usually considered). These are related especially to the quality of output or services in order to improve the performance of the organization / department and motivate and enrich the work of employees. This group carries on continuously as a part of organization-wide control activities, self and mutual developments and control and improvement within the workplace utilizing quality control techniques with all the members participating. Generally six to twelve volunteers from the same work area make up a circle. The members receive training in problem solving, statistical quality control and group processes. Quality Circle generally recommends solutions for quality and services which may be implemented by the management. Thus Quality Circle is not merely a suggestion system or a quality control group but extends beyond that because its activities are more comprehensive. Furthermore, it is not a taskforce because it can be made a permanent feature of the organization or a department. Japanese nomenclature: Quality Control Circles (QCC), generally now known as Quality Circles (QC) or some call it as Small Group Activity (SGA). 1962: First QC Circle was registered with QC Circle Head Quarters in Japan. 1974: Lockheed Company, USA started Quality Circle movement. 1977: International Association of Quality Circles (IACC) was formed in USA. 1980: BHEL, Hyderabad first in India to start Quality Circles. 1982: Quality Circle Forum of India (QCFI) was founded. There are various forms and styles of participative management. One of them which is widely applied and practised is ‘Quality circles’. The ‘quality circle’ concept first originated in USA which was very successfully applied in Japan afterwards. This technique boosted the Japanese firms to endeavour for high quality products at low costs.